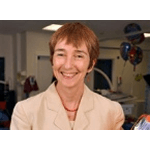 Deirdre is Professor of Paediatric Hepatology at the University of Birmingham, Consultant Paediatric Hepatologist and Founding Director of the Liver Unit for Birmingham Children’s Hospital NHS Foundation Trust. She set up the Liver Unit at Birmingham Children’s Hospital which provides a national and international service for children with liver failure and undergoing liver transplantation, transforming survival and outcome for these children. She runs an active research programme focusing on viral hepatitis in children, molecular genetics of inherited liver disease, quality and outcome of life following liver and/or intestinal transplantation.